You should encourage your patient to ambulate, or walk, often in order to stay healthy. This is especially true for patients who recently had surgery, unless they have been ordered to be on bedrest. As soon as they are allowed, they should start walking. This may not sound like a big deal to some people, but it has been proven time and time again that ambulating helps people in many different ways. It strengthens their joints, muscles, and blood flow just to name a few. Working in a hospital as a registered nurse, I know how much it is encouraged. There's even a dedicated team known as physical therapy (PT) who assists patients with this. No matter how bad some patients want to stay in bed, they are encouraged to get up and walk to the bathroom or better still, around the hallway. It's often hard to determine how far your patient should ambulate. Some physicians may give out specific requests but if they don't, you may have to help make that call. If your patient can barely make it to the bathroom without getting dizzy or cringing in pain, you need to think twice about going much further. It's not worth getting halfway down the hallway or onto the other side of their house and not being able to make it back to their bed or chair. If you have your doubts, take it slow. Have them walk around their room before walking elsewhere. The hallways in the units I normally work on form a big loop which is perfect for patients to walk around. Some of them may only make one loop around while others make several. The more, the better. PT will often follow them around with a chair just in case they need to rest in between. While walking with them, always ask them at least every 20 to 30 seconds if they are feeling dizzy or lightheaded. If they say yes, either find a chair close by and take a break, or get them back to their own bed or chair immediately. You have to consider their safety above all else especially if they are a fall risk. I've had a patient inform me they were feeling like they were about to pass out and sure enough, they did. Luckily, she was light and I was able to hold onto her while someone got a chair to sit her on. If something similar happens and you aren't able to hold them up, gently lower them to the ground. How often should your patient ambulate? Again, it's hard to say. On average, I'd say at least three times a day. If your patient is willing to walk more, by all means, let them. The more times they walk, the easier it will become. My grandmother used to go for a walk outside every day. As she gets older, she isn't able to do this as often especially since she has to use stairs. She unfortunately has fallen multiple times. Stairs can be a big barrier in many cases. If possible, building a ramp can often give much more freedom. If you work in a hospital or similar facility, you may be pressed for time. However, this should not stop you from walking with them as much as possible. It is vital for their health and recovery. If you don't have the time, maybe someone else does. 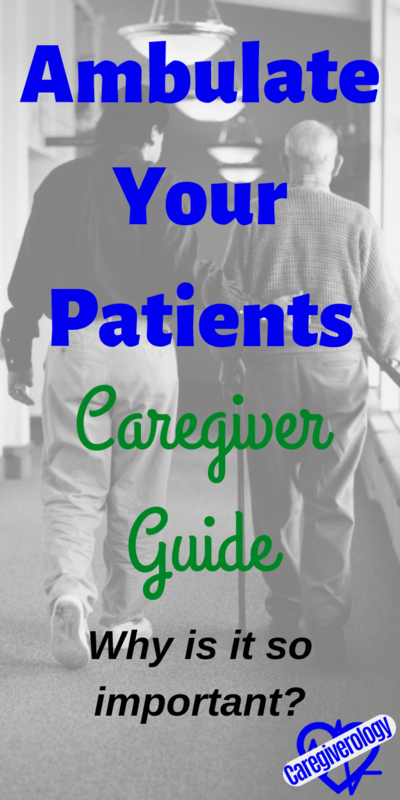 Talk to your supervisor if you feel you do not have the resources to walk with your patients often enough. 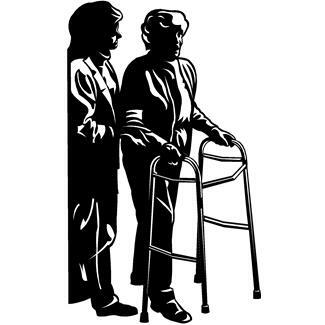 Some patients may be able to walk wherever they want by themselves while others may need you to walk with them. Others will need a helping hand to keep their balance while others still will need a cane or walker, or sara stedy. Many of my patients simply use their IV pole to help keep their balance. Another common method, although I am not very familiar with it, is assisting your patient with a gait belt. These belts wrap around your patient and you hold onto it and help them along. For some patients, you really have to have a good grip on that belt while others wear it just in case. Don't be afraid to ask your patient what method they would be most comfortable using. If they aren't sure, use the safest method possible. It's better to start out slow and work your way up. Don't give them too much freedom too fast. If it is so important for patients to ambulate, why aren't more of them doing so more often? There are too many reasons to list but many of them revolve around pain. The problem with this is, the less they move, the more pain they will be in when they finally do move. So they need to push themselves before they feel worse. This can be a challenge, especially right after painful surgeries. Depending on what type of surgery, some patients have to wait until physical therapy comes in and assists them which could take days, others may be told to get up in just a few hours. Whatever the recommendation is, you should encourage your patient to act upon it. I have known many patients who have gotten very frustrated with physical therapy because they can be very pushy. The reason they push so hard is because they know how important it is for their patients to ambulate. Do not get angry with them. You and your patient will thank them in the long run. This is a set of step by step instructions based on the clinical skills portion of a certified nursing assistant (CNA) exam. In this particular case, the patient is able to ambulate fairly well, but is unsteady and has some generalized weakness. Step 2: If the patient is in bed, place them in an upright position. Place one of your arms behind both of the patient’s shoulders with your hand wrapped around the shoulder furthest away from you. Place the other arm underneath both of the patient’s knees with your hand wrapped around the knee furthest away from you. Position yourself correctly by keeping your back straight, positioning your feet apart, and bending your knees slightly. In a smooth and pivot fashion, swing their upper body sideways to a sitting position while simultaneously swinging their legs to the edge of the bed. Their feet should be positioned together and placed flat on the floor. Raise and lower the bed as needed. Step 3: Have them stay in this position for at least 5 seconds. Hold onto them for a few seconds at first. Be sure they can sit up straight on their own. Ask them about weakness, dizziness, or lightheadedness. Step 4: Put on their footwear. If it is non-skid socks alone, place them securely on each foot with the grips on the bottom of their feet. If it is their own personal footwear, make sure the shoes are non-skid and are placed and tied securely on each foot. Step 5: Grab the gait belt. Place the belt around the patient’s waist. Fasten it with the teeth gripping the belt securely. Be sure it isn’t too tight or too loose by placing four fingers snugly between the belt and the patient. Ask the patient if the belt feels comfortable and secure. Step 6: Position yourself properly to stand them up. Place your feet about a foot apart. Position one foot perpendicular to and in front of the patient’s feet. Place your other foot parallel to the patient’s body and perpendicular to the bed. Step 7: Stand them up. Ask the patient to either place their hands on the bed or on your shoulders. Grip the belt securely with both hands behind the patient’s back. On three, without jerking on the belt, firmly lift up to assist the patient to a standing position. Keep them standing still for at least 5 seconds until they completely catch their balance. Ask them if they are dizzy or lightheaded before continuing. Position yourself slightly behind them while facing the same direction they will be ambulating. Be sure to hold the gait belt firmly at all times with one or two hands either on the center of their back or on the side furthest from you. Step 8: Assist them to ambulate. 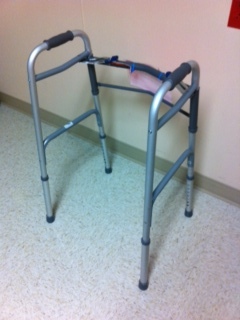 Tell the patient to begin walking when ready while allowing them to lead the way. Ask them often about dizziness and fatigue. Have them walk at least ten steps before turning around. Have them walk back to where they began at either their bed or chair. Be sure the back of their legs are slightly touching the bed or chair. Slowly and gently lower them onto the bed or chair while keeping your back straight and bending your knees. Gently remove the gait belt. All of this should be done in a slow, smooth, continuous, and controlled fashion without injuring the patient. Step 9: If they are getting back in bed, make sure they get back in properly. In a smooth and pivot fashion, swing their upper body sideways to a lying position while simultaneously swinging their legs back onto the bed. Have them slide towards the center and up in bed as needed. Step 10: Perform your closing duties. Place the call bell either in the bed or chair with the patient or within their reach. Make sure the bed alarm or chair alarm is on if necessary.